All videos and screenshots in this interview are taken from the Japanese version of the game. The final version is fully localised in English. Please note: Some in-game terms may differ in the final release. Ah, you’re talking about what happened with WarioWare: Snapped!1, aren’t you? About you-know-what2... (laughs)1. 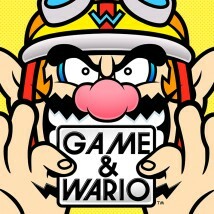 WarioWare: Snapped! was a Nintendo DSiWare title released in Europe in April 2009. It utilised the Nintendo DSi system’s inner camera to play a number of microgames.2. This refers to a microgame in WarioWare: Snapped! in which the player’s face is filmed without them knowing it will be shown at the end. 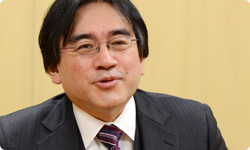 A video of Satoru Iwata playing this microgame was made public on the Nintendo website. You won’t be trying to get one over on me this time around, will you? With work on Game & Wario complete, I want to talk to you today about the development process for this project. Can I start by asking each of you to explain what your role in the project was? 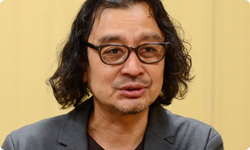 My name is Yoshio Sakamoto and I work in Nintendo’s Software Planning and Development department. I have had a lot of involvement in the WarioWare series3 in what you might call a consultant role. On this title, I had the same kind of role, discussing ideas with Abe-san and offering my thoughts and opinions.3. The WarioWare series features a range of fast-paced microgames that require quick-fire reactions. The first title in the series was released for Game Boy Advance in May 2003. So far, there have been eight titles in the series, including Nintendo DSiWare and WiiWare games. 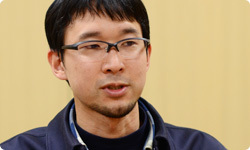 My name is Goro Abe and I also work in the Software Planning and Development Department. My role as the director was to think about and decide on the game’s overall features. I would then ask Mori-san, who is sitting next to me, to work on developing those features, and that’s how development proceeded. 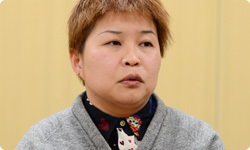 My name is Naoko Mori and I work as a director for INTELLIGENT SYSTEMS4. My main task was to work on developing the ideas Abe-san wanted to see in the game, and to implement them.4. INTELLIGENT SYSTEMS Co., Ltd is a video game developer that has worked on a large number of titles for Nintendo systems, including the Fire Emblem and Paper Mario series. The company originally also made development tools for Nintendo systems. Now, this is going back quite some time, but could you tell me about the nature of the task facing you when you originally took on this project, Abe-san? Well, at first, the idea was to make a game that would come pre-installed on the Wii U console. I became involved in the project when it was already underway, and I began by asking myself what kind of games the Wii U GamePad might make possible. So you started off by coming up with ideas alone, then INTELLIGENT SYSTEMS got involved, and you worked together to develop the game. That’s right. When I had an idea of the overall direction for the project, I knew that I needed to try these ideas out to see whether or not they would be fun, so I asked INTELLIGENT SYSTEMSs to work on realising the ideas I’d had. Well, the team knows the WarioWare series inside out, doesn’t it? Mori-san, when did Abe-san first discuss this title with you? It was in January two years ago. The features that Wii U would have were explained to me, and things started from there. So you have been working continuously on this project for the last two years? When development started, you didn’t aim to create what’s now completed as the final product, did you? No, we didn’t. The original plan was that the game would come pre-installed on the Wii U console, so it wasn’t actually conceived of as being part of the WarioWare series. E35 was approaching, and we began working on something that we could present and which would be easy for people to pick up and play.5. E3 refers to the Electronic Entertainment Expo, an annual video game trade show held in Los Angeles. Wii U was unveiled at E3 in 2011. So we’re talking about the E3 that took place in June 2011, aren’t we? All videos and screenshots in this interview are taken from the Japanese version of the game. The final version is fully localised in English. Please note: Some in-game terms may differ in the final release. 'PIRATES' . We had a prototype of this game, known as ‘Shield Pose’ which we presented. You held the GamePad like a shield and blocked the arrows which flew from the TV screen. What was the original idea behind that game? So you knew that you had to apply the mental brakes, so to speak. That’s right. As this was to be a pre-installed game, our overriding priority was to demonstrate the features of the system in the clearest, most elegant way. Mori-san, did you find this necessity to come up with a product that was rather less unruly than the WarioWare series constrictive at all? Well, we have always taken the WarioWare titles seriously. Ah, yes, you’re right. With the WarioWare games, you have always come up with all manner of strange ideas, but you have gone about it in a very serious manner. Yes, exactly! (laughs) But with this title, we initially thought that this approach wasn’t going to wash.
That’s right. So as we worked on this game, we would put to one side all those crazy, out-there ideas that might have really appealed to certain players, but not to everyone. I can see why this project, in its initial form, might have felt a little constrictive for this particular team. Sakamoto-san, what was your take on things, from your position outside the main team? Well, I was concerned that the team was struggling, but at the same time, given the constraints the team was working under due to the nature of the software, I didn’t feel like it was my place to wade in and force my opinions on everyone. So even though you were worried, you thought it was better to observe things from a distance. That’s right. At that point, I wasn’t deeply involved in the title. Abe-san told me about the way he envisaged the game, and I told him that it sounded interesting, but deep down inside, I did wonder whether he was really going to set about making it in a serious manner. (laughs) It sounds like you basically just let him get on with it! Well, yes. In effect, that’s what I did. But when you first played the ‘PIRATES’ prototype, you told us that we needed to shake things up! Oh? Did I really say that? Erm... Well, apparently I did. (laughs) It’s a long time ago now, so I can’t say I recall. But I remember feeling very grateful to you. Did you feel that this was the moment you’d been waiting for? It sounds like it may have been the gentle shove in the right direction you had all been waiting for.